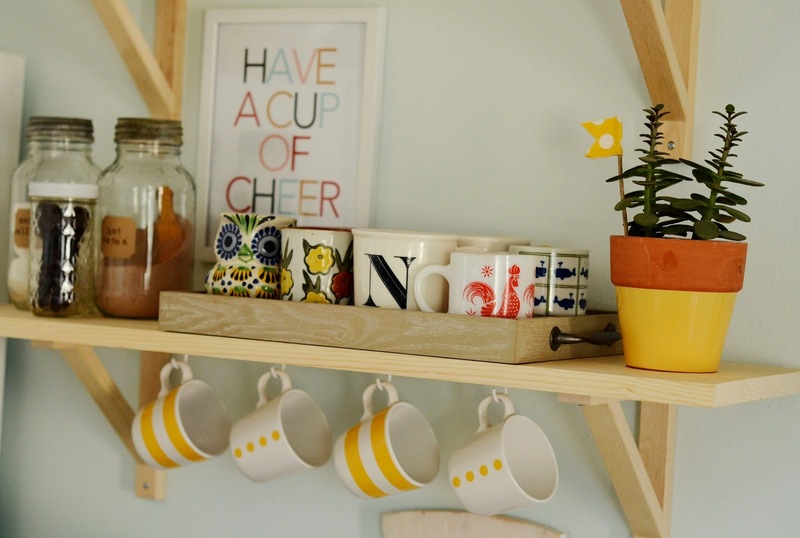 natalie creates: our coffee bar! 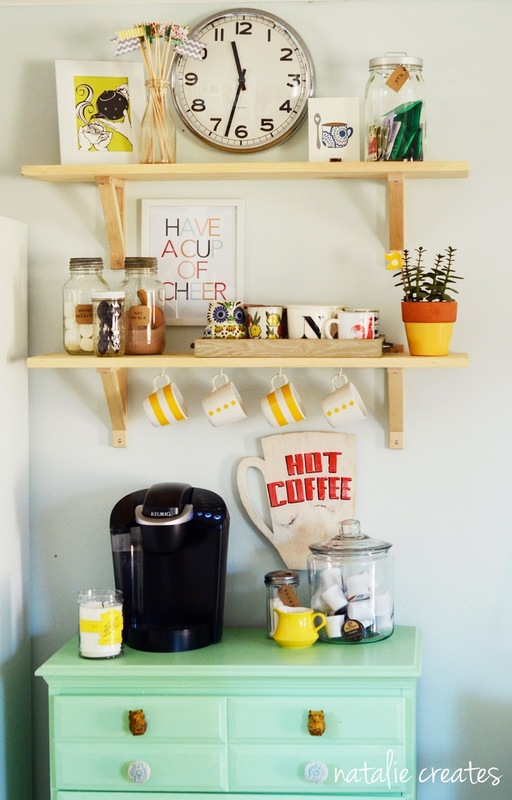 i am so excited to share with you the newest corner of our home- our coffee bar! and this inspiring image from heather's home made lovely series. i love creating corners with purpose in our home. corners that are fully lived in & enjoyed by our family & guests. we love hosting parties, potlucks, craft nights & more. 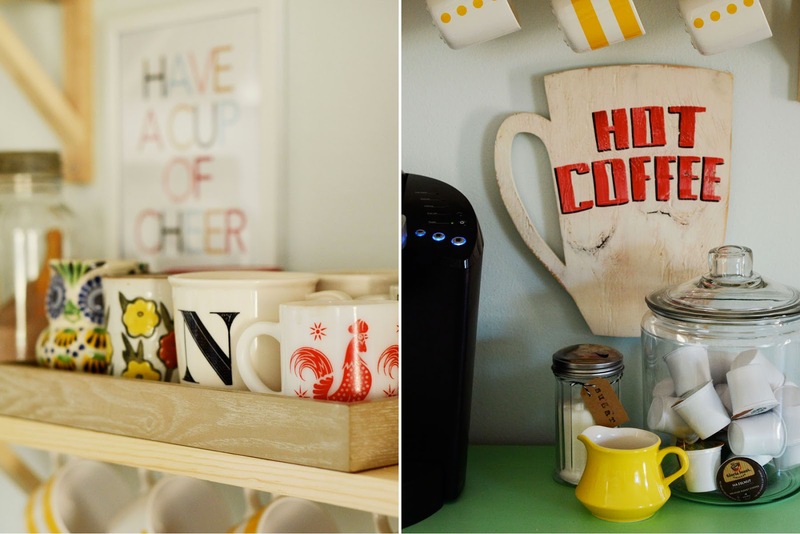 it's so nice to have this space for our guests to make coffee, hot cocoa & tea on a whim. as always, my budget was small. thankfully, my parents purchased the keurig as a christmas gift for our home (thanks, mom & dad!). i had some money saved up & was able to splurge just a bit & spend under $150 on this project. 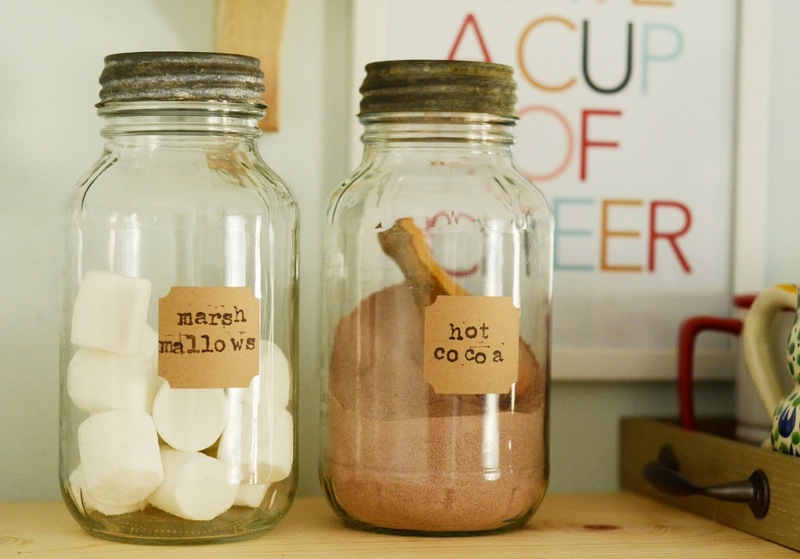 i re-used containers, including these jars our neighbor gave me, to hold hot cocoa, marshmallows & tea. i painted the old dresser & added new knobs from hobby lobby. i purchased the large container that holds the k-cups from target for less than $10 & thrifted the sugar container for less than $1. i adorned my containers with brown tags & brown labels i already had in my stash. 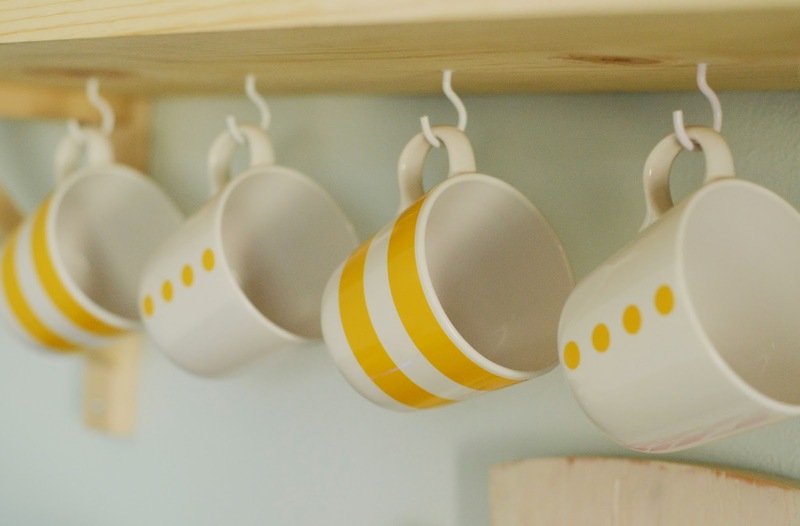 i purchased the yellow mugs from ikea on our recent trip to houston. i just love them. i am so happy with the way this little corner turned out! c'mon over & have a cup of cheer anytime! - happy flags made by me & available in the shop very soon! - hot coffee wooden sign by homegrown sign co.
your home decor ideas are so fabulous! thank you for sharing! So fun! 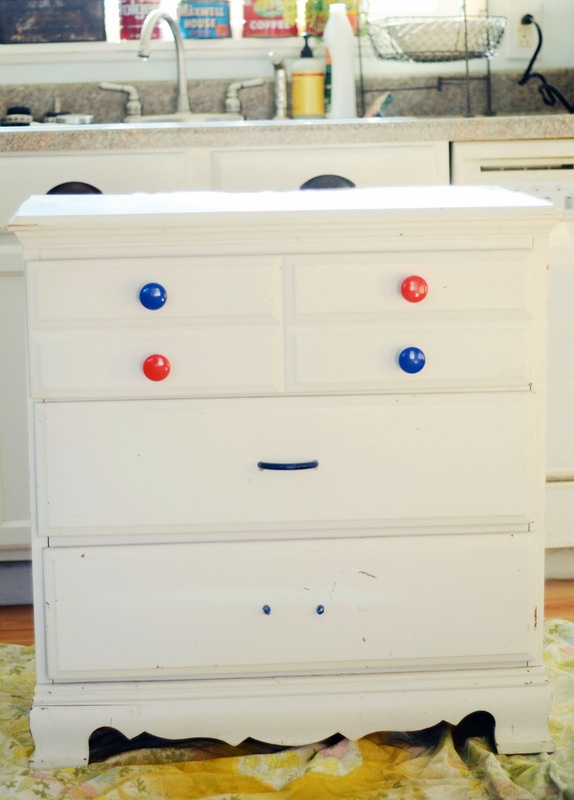 I'm wondering two things: what color did you choose for the dresser? What do you keep in the dresser? Another random question/blog request: what is your cleaning schedule like? I know you have doggies (we have kitties) and I wonder how you keep the hair and dust at bay which is ever-present with animals in the house (especially with items left out open on shelves). Love seeing purposeful corners of your home! Such a cozy coffee corner! 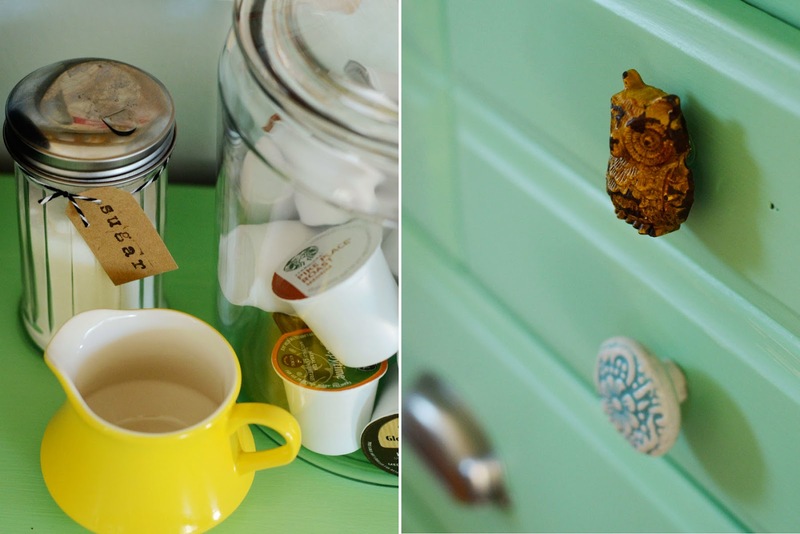 I'd also like to know the name of your paint colour - the mint and yellow look so nice with the natural wood. Great job! Can you share where you bought the clock? Thanks!! meghan, it's originally from ikea, but i purchased it from a yard sale! Hey I loooove this setup!! :) can you tell me where u got the shelves from?